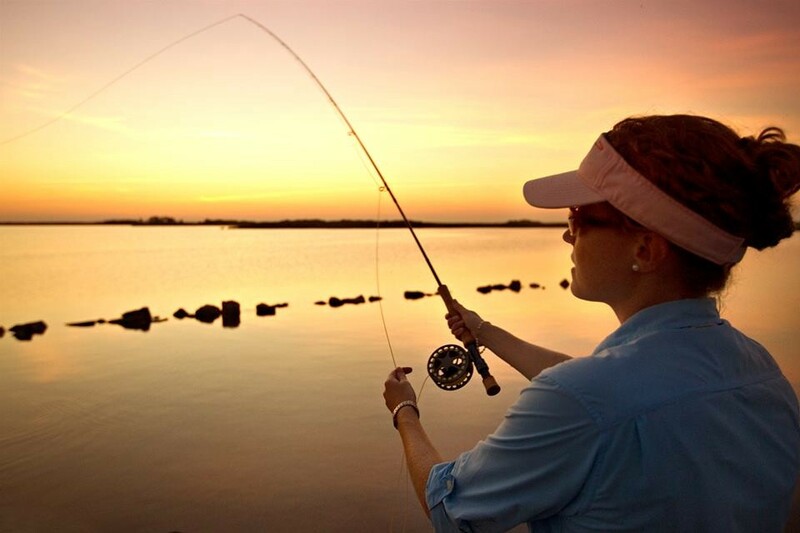 With over 40 million people fishing each year, it can be a great way to spend time outside with family and friends. Whether you’re revisiting something you haven’t done in years or you’re wanting to try it for the first time, don’t feel overwhelmed! These basics will get you started. You’ll find everything you need at a fishing tackle or sporting goods store. Learn more about fish species you may see! Pass line through the hook eye and, with the tag end, make 5 turns around the standing line. Insert the loose end of the line between the eye and the first loop formed. Bring the tag end through the large second loop formed. Wet the line and tighten the knot slowly. Now you are ready to set up your rod with hook, line, and sinker. Tie on a fish hook. Attach 1 or 2 sinkers, 6 to 12 inches above the hook. This weight will keep your bait or lure down in the water and will help swing it away from shore. A bobber lets you know when fish are biting, because it moves up and down in the water as fish nibble at the bait. Most bobbers attach to fishing line with a spring clip and move up and down the line easily, depending on how deep you want to fish the bait. What Tackle Can I use? With spin casting or spinning tackle, you can put the bait or lure where the fish are. You can cast greater distances with more accuracy, work lures effectively, fish in deeper water, and handle larger fish more easily with this tackle. 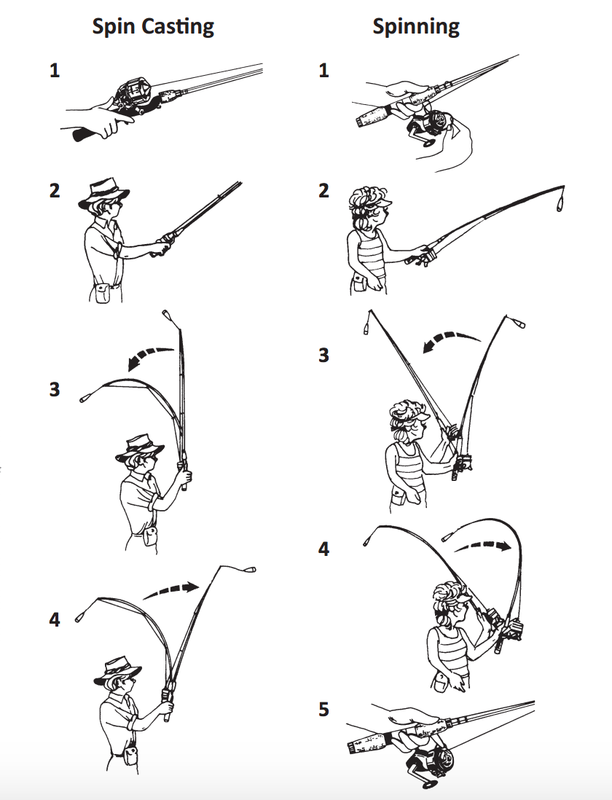 Spin-casting outfits use a rod with a pistol-like grip and a reel that’s mounted on the top of the rod’s handle. Line is released using a push button on the reel. This is the easier rod and reel for beginners. How Can I Learn to Cast? Once you’ve selected a spin-casting or spinning outfit, use the Improved Clinch Knot demonstrated above to tie on an inexpensive rubber covered weight called a casting plug. Next, find an open area away from other people where you can practice casting. A tackle box will store a variety of lures, hooks, snap swivels, weights, and tools like long-nose pliers and other gear you can use. You might also need a live bait container (such as a minnow bucket or a worm box), a stringer or an ice chest to keep your catch fresh, a landing net, and a first-aid kit for minor emergencies. Fish should never be wasted. If you catch a fish that is under the legal or minimum size or that you do not want to keep, release it quickly. If possible, keep the fish in the water and handle it carefully. When it begins to wiggle and can swim normally, let it go. Don’t cast near other people, and always look around before making a cast. Wear a Coast Guard-approved personal flotation device or life vest when wading or in a boat. A good angler respects our natural resources and wants to conserve them for others to enjoy. Always carry out what you brought in and never leave behind plastic containers or packaging. Fishing line is very dangerous to birds and other wildlife, so pick up and recycle. There are many places to fish and they’re likely closer than you think. Including many national wildlife refuges! Look for a weedy or rocky area where the water is several feet deep. Look for areas where the bottom changes in some way — from sand to gravel or from sand to mud. Stay quiet and avoid disturbing the water or you may scare fish away. Next, bait your hook. Swing the bait as far from shore as you can and watch the bobber. When a fish bites, raise the tip of the rod quickly to set the hook and reel your catch in. >> Learn more about fish species you may see! This was adapted from the “fishing is fun for everyone” brochure. We’re dedicated to the conservation, protection and enhancement of fish, wildlife and plants, and their habitats.